The PureDrip Bacteria/Heavy-Metal Gravity Water Filter is a 4-stage, portable, gravity-fed comprehensive water filtration system. The PureDrip is the only stand-alone, gravity water filter system which meets EPA requirements for bacteria and protozoa and has the highest bacteria removal rate of any gravity water filter on the market. The PureDrip Makes Even River and Lake Water Drinkable! 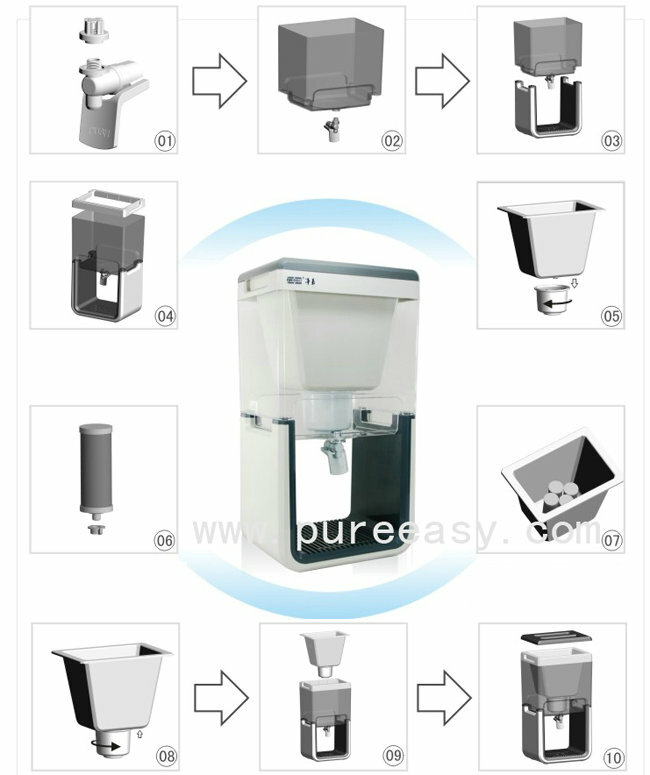 Even from lake and river water the PureEasy, PureDrip 4-Stage Bacteria/Heavy-Metal Gravity Water Filter will obtain 9999% Removal of Pathogenic Bacteria! This large 8-gallon water filter system is sold to the Red Cross and other NGO organizations for use in emergency situations, such as earthquakes and floods. It provides a ready, convenient and ample source of purified water to travelers, campers, field expeditions, homes and offices. The PureEasy PureDrip Gravity Water Filter filters 2 1/2 gallons at a time in the upper bin and stores up to 4 gallons in the lower [filtered] storage bin. No matter where you live and how large your group, you need not ever run out of clean, naturally purified drinking water. Perfect for Your Family or Group's Disaster Preparedness! This fantastic stand-alone water filtration system does not rely on water pressure! Therefore it is the perfect back-up system for any family wishing to ensure an ongoing, potable water supply in the event of disaster. The PureDrip Filter system is completely BPA free and made with food-grade AS and ABS plastics. The PureEasy Filter Systems use an extraordinary design and dual-ceramic casings to their filters which remove all sediment, rust, etc. and clarify the water to beautiful, pure-looking levels before that water even goes through the carbon and other filter layers. What this means is better taste, clarity of water and a much longer filter life. The outer layer of the dual-ceramic catches all of the impurities in the water down to .5 microns, and won't let it enter the filter. If the filter slows down over time, then the sediment collected on the ceramic filter can be lightly scrubbed off, allowing you to extend the life of the filter by at least twice that of a plastic-cased or fiber-cased filter of its kind. The PureEasy PureDrip 4-Stage Gravity Water Filter purifies the water of all harmful toxins but allows the healthy minerals and trace elements through. Removes 99.9999% Pathogenic bacteria (E. coli, Staphylococcus aureus, Salmonella typhi, Vibrio cholerae, Legionella pneumophila, 100% Giardia, Cryptosporidium, and other parasites, particle contaminates). Removes unpleasant tastes, chemicals and odors. Note: The carbon in these filters will remove chlorine or chloramine if it's in the water. Removes residual chlorine, heavy metal ions (Pb2+, Cd2+, Cr6+) etc. and inhibits bacterial growth. This is some of the best filter media there is to remove chemicals, toxins and heavy=metals from the water. Excess hardness, heavy metal ions such as Pb2+, Cd2+, Cr6+, etc., fluoride and arsenic. The 4 ceramic filters of the PureDrip Gravity Filter System should last indefinitely. However be careful, because they can break or crack. If one does you will need to replace it. The Media Tray removes heavy metals and toxic chemicals from the source water. It is rated for an average of 2,000 gallons (depending on the quantity of toxins in your water). Make sure to change it minimally every 2 years of use. PureEasy Filter Systems are Long Lasting! The C-1 ceramic is designed to remove every spec of bacteria, fungus, algae, sediment etc. from the water. 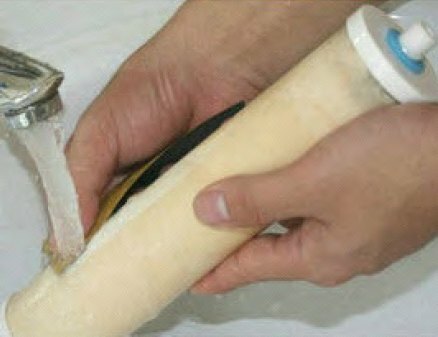 It will occasionally clog if there is heavy sediment or dissolved solids in the water. If this happens you can clean the C-1 ceramic to renew it if at any time the filter's flow-rate slows down. The cleaning pad is included. Fill the upper bin with water and then let it pour through. If the water is coming out clear at that point, then you're done. If not, then repeat and it will be clear then. The filters should be changed every 2,000 gallons for the average water quality. The PureEasy company is founded by senior water treatment experts, and owns several patented, world-leading technologies in the water treatment industry. Learn more: https://www.alkalinewaterplus.com/pureeasy-filter-systems/ They are located near GuangZhou, China.